For the treatment and control of gastro-intestinal nematodes, lungworms, eyeworms, warbles, mange mites and lice in cattle and pigs. POM-VPS. A clear, colourless, slightly viscous, non-aqueous sterile solution. May also be used as an aid in the control of the mange mite Chorioptes bovis and biting lice Damalinia bovis, but complete elimination may not occur. Treatment at the recommended dose rate can control re-infection with Haemonchus placei and Cooperia spp. acquired up to 14 days after treatment, Ostertagia ostertagi and Oesophagostomum radiatum acquired up to 21 days after treatment and Dictyocaulus viviparus up to 28 days after treatment. To obtain optimal benefit from the persistent activity of the product for grazing animals, it is recommended that calves which are set-stocked in the first grazing season should be treated 3, 8 and 13 weeks after the day of turn-out. This can protect the animals from parasitic gastroenteritis and lungworm disease throughout the grazing season, provided they are set-stocked, all the calves included in the programme and that no untreated cattle are added to the pasture. Treated animals should always be monitored according to good husbandry practices. Do not use by intramuscular or intravenous administration. Resistance to ivermectin has been reported in Teladorsagia circumcincta in sheep and Ostertagia ostertagi in cattle. Therefore, the use of this product should be based on local (regional, farm) epidemiological information about susceptibility of these helminth species and recommendations on how to limit further selection for resistance to anthelmintics. The product has been formulated specifically for use in cattle, sheep and pigs. It should not be used in other species as severe adverse reactions, including fatalities in dogs, may occur. Take care to avoid self-administration: the product may cause local irritation and/or pain at the site of injection. Direct contact of the product with the skin should be kept to a minimum. When using the 250 ml and 500 ml pack sizes, use only automatic syringe equipment. For the 50 ml pack size, use of a multiple dose syringe is recommended. To refill the syringe, use of a draw off needle is recommended to avoid excessive broaching of the stopper. Transient discomfort has occasionally been observed in cattle following subcutaneous administration. A low incidence of soft tissue swelling at the injection site has been observed. Discomfort, sometimes intense but usually transient, has been observed in some sheep immediately following subcutaneous administration. All these reactions disappeared without treatment. Do not use in non-lactating dairy cows or sheep within 60 days of calving/lambing. The product can be used in sows during lactation. Fertility is not affected by administration of the product. The product can be used concurrently without adverse effects with foot and mouth disease vaccine or clostridial vaccine, given at separate injection sites. 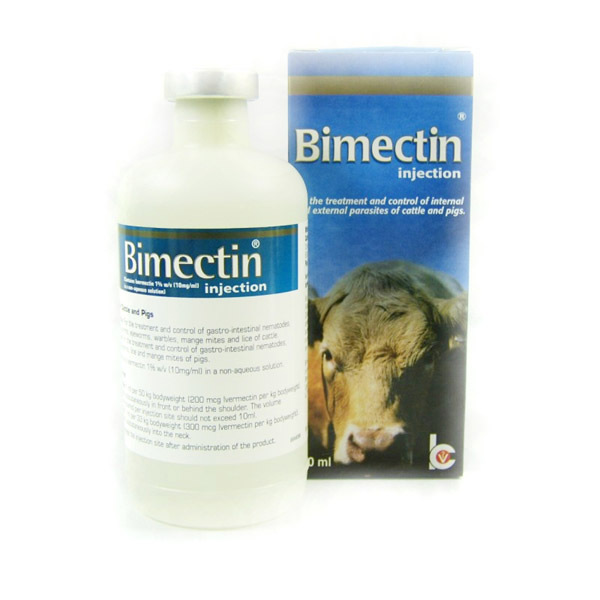 The product should be given only by subcutaneous injection at the recommended dosage level of 200 mcg ivermectin per kg bodyweight under the loose skin in front of, or behind, the shoulder in cattle and over the neck in sheep. At the recommended dosage level of 300 mcg ivermectin per kg of bodyweight, the product should be given only subcutaneously in the neck of pigs. Each ml contains 10 mg of ivermectin sufficient to treat 50 kg of bodyweight of cattle and sheep and 33 kg of bodyweight of pigs. The injection may be given with any standard automatic or single-dose or hypodermic syringe. Use of 17 gauge x ½ inch needle is suggested. Replace with a fresh sterile needle after every 10 to 12 animals. Injection of wet or dirty animals is not recommended. If using a single-dose or hypodermic syringe, use a separate sterile needle to withdraw the product from the container. Massage the injection site after administration of the product. In young pigs, especially those below 16 kg for which less than 0.5 ml of the product is indicated, dosing accuracy is important. The use of a syringe that can accurately deliver as little as 0.1 ml is recommended. In young lambs weighing less than 20.0 kg give 0.1 ml per 5 kg. In these lambs the use of a syringe with can deliver as little as 0.1 ml is recommended. Cattle:Single doses of 4.0 mg ivermectin per kg (20 x the use level) given subcutaneously resulted in ataxia and depression. At dose levels up to 4 mg ivermectin per kg (20 x the use level) given subcutaneously resulted in ataxia and depression. No signs of systemic toxicity were observed in sheep treated with the product at up to 3 times the recommended dose rate, soft tissue swellings at the injection site were observed. A dose of 30 mg ivermectin per kg (100 x the recommended dose of 0.3 mg per kg) injected subcutaneously to pigs caused lethargy, ataxia, bilateral mydriasis, intermittent tremors, laboured breathing and lateral recumbancy. In the case of overdosage, symptomatic treatment should be given. Meat and offal: 49 days. Do not use in lactating cows producing milk for human consumption. Do not use in non-lactating dairy cows including pregnant dairy heifers within 60 days of calving. Meat and offal: 42 days. Pharmacotherapeutic group: Endectocide. ATC vet code: QP54AA01. Pharmacodynamic propertiesIvermectin is a member of the macrocyclic lactone class of endectocides which have a unique mode of action. Compounds of the class bind selectively and with high affinity to glutamate-gated chloride ion channels which occur in invertebrate nerve and muscle cells. This leads to an increase in the permeability of the cell membrane to chloride ions with hyperpolarization of the nerve or muscle cell, resulting in paralysis and death of the parasite. Compounds of this class may also interact with other ligand-gated chloride channels, such as those gated by the neurotransmitter gamma-aminobutyric acid (GABA). The margin of safety for compounds of this class is attributable to the fact that mammals do not have glutamate-gated chloride channels, the macrocyclic lactones have a low affinity for other mammalian ligand gated-chloride channels and they do not readily cross the blood-brain barrier. Cattle:At a dose level of 0.2mg ivermectin per kg a maximum plasma concentration of 35-50ng/ml is reached in ± 2 days and the half-life in plasma is 2.8 days. It is also established that ivermectin is carried mainly in the plasma (80%). This distribution between plasma and blood cells remains relatively constant. Pigs:During trials carried out at a dose rate of 0.3mg ivermectin per pg bodyweight, peak plasma concentrations were reached in 3 (±0.5) days and the drug persisted in plasma for up to 28 days. Cattle:Only about 1-2% is excreted in the urine the remainder is excreted in the faeces, approximately 60% of which is excreted as unaltered drug. The remainder is excreted as metabolites or degredation products. Sheep:Radioactive ivermectin was administered to sheep as a dose rate of 0.3mg per kg. Analyses of the faeces showed that about 99% of the drug and its metabolites are excreted in the faeces, ±1% being excreted in the urine. Pigs:Biliary excretion is also the major route of ivermectin excretion in pigs. Multiple-dose polyethylene bottles of 50 ml, 250 ml and 500 ml sealed with bromobutyl seals and aluminium overseals, each containing a clear, colourless sterile solution.Not all pack sizes may be marketed. There are currently no questions for Bimeda Bimectin Injection - be the first to ask one!